PLOT SUMMARY: After overhearing a messy breakup at a party, Claudia finds herself in hot water with the school mean girl, Iris Huang. Being dumped by her girlfriend, Paige, has left Iris in an even fouler mood than normal, so Claudia intends to stay out of her way. This plan is thrown off-course when Claudia and Iris get forced to work together on the school play. (In Iris' words, their teacher is High School Musical-ing them.) As the school gets ready for their performance of A Midsummer Night's Dream, Claudia and Iris begin to get to know one another... and develop a shaky friendship. FIRST THOUGHTS: SHOULD'VE BEEN GAY. Okay, okay - technically, it IS gay, since Iris is a lesbian. But still. I was honestly shocked when Claudia was not, in fact, Iris' love interest. (Shoutout to my friend Annie, who got to hear me scream about the Claudia/Iris ship the entire time I was reading.) Honestly, I had a hard time writing this review, because I'm having difficulties articulating my thoughts on this book. I thought it was good, and it's a really cute, lighthearted story, but I'm not sure what to SAY about it. But, I can't put off reviewing forever -- and this was, overall, a good book. I'm just having trouble getting my thoughts down into words. THOUGHTS ON PLOT: The plot was... lacking. I was excited when I heard that the two leads would be forced to work on a school play together, having a background in theater myself. So it was a bit disappointing when we didn't get to see much of the action backstage. Instead, we get mostly scenes of characters bouncing off one another at school, at parties, or over the phone. And don't get me wrong, those scenes are nice, but it's not what I was expecting. There was very little tension in the story, which was also a source of frustration. (I mean, there is ONE moment about 3/4 of the way in, but it's resolved in fifteen pages and could've easily been omitted.) Overall, this is a very, very "slice of life" novel. If you like that genre, you'll probably like this plot more than I did. THOUGHTS ON CHARACTERS: Claudia is a pretty good main character. She's likable and easy to relate to, and has a very easygoing personality. However, by far the best-developed character is Iris, who is surprisingly three-dimensional, especially once she begins to make friends with Claudia. These two had one of the best and most believable friendships I've read in YA, and their banter was just a delight. It was really great to see these two grow and change because of each other, especially as Iris goes from a selfish, unlikable ice queen to a much more compassionate and openly vulnerable person. And, as much as I ship Claudia with Iris, I wound up liking Claudia's actual love interest, Gideon, a lot, too. He's not quite as compelling as Iris and Claudia, but he was a surprisingly easy-to-like guy, compared to other YA love interests. I felt that the side characters were a bit underdeveloped, though. I especially feel like more could've been done with Paige, Iris' ex. We know that she's nice, and... that's it. That's not to say a character's main personality trait being "nice" is bad; it's not. But it's good to have more than that, you know? THOUGHTS ON WRITING STYLE: Claudia serves as our narrator here, and that's probably a good thing, since the most we got about her personality came from her internal monologue. As I mentioned before, this book is light, fluffy, and easy to read -- Claudia's narration draws the reader in, and is well-written enough to keep you invested, even when the plot is kind of dragging. I was also pleasantly surprised at how well the scenes where Claudia is playing her favorite MMORPG were written; it's easy for scenes that describe characters playing a game or sport to be overly-wordy or tedious, but these weren't at all. Overall, this had some very nicely done narration, and a compelling voice to keep the reader drawn in. THOUGHTS ON POLITICAL STUFF: One of the main characters is an Asian-American lesbian, and her ex-girlfriend is a prominent side character. There's also a side character that's epileptic. While this is about it in the representation department, I did like how neither of these characters were tokens. They both have personalities, motivations, and development completely unrelated to their identities. Iris, in particular, could've been straight, and the book wouldn't have been different at all. But she's not straight, and that's a very welcome change from the norm. It's so good to see YA slowly becoming more and more diverse. 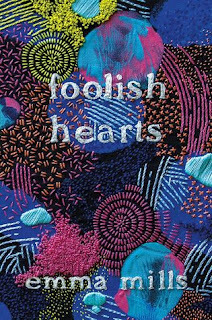 If you've read Foolish Hearts, I'd love to hear your thoughts in the comments below!